BACKGROUND: Human resources are the most important tool in agility of organization and is considered to be the most valuable asset of any organization. Agile emergency system can reduce production costs, increase market share, fulfill the needs of patients, and most importantly, it reduced the mortality and morbidity from diseases and crashes. OBJECTIVE: The purpose of this study was to determine the correlation of human resource agility with performance of the staff of Tehran Emergency Center (TEC). MATERIALS AND METHODS: This research is a descriptive-correlational study and 285 operatives from TEC, with a population of 1100 were selected according to Morgan table and simple random sampling. The data of this research were collected using human resource agility capabilities questionnaire and Patterson job performance questionnaire. SPSS/18 software and descriptive-inferential tests were used to analyze the data. RESULTS: The results show that the correlation between organizational agility and employee performance is 0.754 and is significant (P = 0.01). The correlation between the employee performance and intelligence and knowledge (0.512), multiple competencies (0.61), knowledge management (0.57), empowerment culture (0.524), and information system (0.63) in significant level (P = 0.05). CONCLUSIONS: The agility of the staff of the TEC is correlated with their performance. Due to the sensitivity of the work of TEC staff, it is recommended that they are planning in such a way that they acquire the agility of themselves and their organizations by acquiring the necessary skills at all levels, especially the operational level. Agility is one of the most important factors in the survival and development of companies in today's dynamic environment. The main feature of this environment is change and uncertainty. The current business organizations face some organizational features, such as rapid technological development, increasing risks, globalization, and privatization expectations. To succeed in this environment, agility creates a competitive edge which can be maintained with fame in innovation and quality. Agile organization synchronizes processes and individuals with advanced technology and fulfills the customer needs based on the high-quality products and services in a relatively short-time frame. However, this happens when agility is considered a systematic organizational value and a competitive strategy for leaders. Most researchers have defined agility as the ability that requires active use of the benefits and opportunities along with positive exposure to competitive threats that all of which are stemmed from frequent and sometimes unpredictable changes. Therefore, the lack of agility can lead to significant real losses and missing opportunities. The goal of the agile organization is to provide satisfaction for customers and employees. For an organization to achieve agility, there must be agility creators within that organization. Staff performance in an organization can show their potential and actual capabilities along with their strengths and weaknesses. Since the main goal of organizations is to achieve the desired goals, therefore, success largely depends on the performance of the employees. Human resources agility may bring a wide range of benefits, such as improving quality, better customer service, increasing learning curve, and saving in a deep and extensive scale., Nowadays, community health and provision of health care is considered a major issue in most countries. The treatment system is the most important institution in providing health services which require skilled human resources, essential equipment, and appropriate facilities. Prehospital emergency which is responsible for the relief and rapid treatment of all emergency patients is one of the fundamental parts of the health system., Meanwhile, the emergency management center faces unexpected changes at any time and saving lives are one of their most important tasks. Therefore, agile emergency system can reduce production costs, increase market share, fulfill the needs of patients, prepare the conditions for the introduction of new services, evaluate and estimate activities with no added value, and increase competition. Hence, the agile emergency system has become a successful strategy in competitive markets by responding to the rapid changes in the needs of patients., The present study aimed to correlate the agility of human resources of the organization with the performance of Tehran Emergency Center TEC staff. This cross-sectional study is a descriptive and correlational study that was conducted in 2015 to investigate the correlation of human resource agility with the performance of TEC staff. The sample population of this study was all the operational staff of TEC (1100 people) that were selected by simple random method. The sample size of 285 operational staff was calculated, according to the Morgan's table using Cochran's formula. Data were collected using human resource agility capabilities questionnaire, and Paterson's job performance questionnaire. Human resource agility capabilities questionnaire was developed by the researcher through consulting with five specialists in the Tehran (Emergency medicine and Health in Emergency and Disaster) and five faculty members (School of Health Management and Information Sciences). To determine the reliability of the questionnaire, test–retest method was used. After the initial setting of the questionnaire, the researcher entered the TEC and completed the questionnaire for 20 of the participants in the research. After 10 days, the questionnaire was returned to the same participants. The correlation coefficient was 88% and the reliability of the questionnaire was confirmed. The reliability of the questionnaire using Cronbach's alpha was 0.75. This questionnaire has five dimensions of intelligence and awareness (8 items), competency (17 items), knowledge management (6 items), empowerment culture (5 items), and information system (6 items). This questionnaire is developed based on the 5-choice Likert scale (completely agree = 5, agree = 4, no opinion = 3, disagree = 2, completely disagree = 1). Each item has a maximum score of 5 and a minimum score of 1. Formal validity was used in this research. By taking the opinions of five experts (teachers and experts on employee agility and their performance at TEC) and having several interviews, the necessary amendments were made and the validity of the tool was confirmed. The second tool was Paterson's job performance questionnaire. This scale consists of two forms, one for employee evaluation and the other for managers' evaluation that each of them contains 10 items. The employee evaluation form has been used in the present study. The answers to the items in this questionnaire are also on a 5-point scale from 1 (very low) to 5 (very high). Shekarkan and Neami translated Paterson's job performance questionnaire in 1992 into Persian in 2001. The reliability coefficient of this questionnaire is 0.74 based on Cronbach's alpha and 0.67 based on the bisection technique. They also reported the validity of the questionnaire as agreeable by correlating with the performance self-assessment questionnaire at the level of P < 0.05. In the present study, the reliability of the questionnaire using Cronbach's alpha was 0.87 and 0.78, respectively. The validity of this scale is accomplished by correlating with a general question r = 0.662 at the significant level of P < 0.001. The validity of this scale was obtained by correlating with a general researcher-made question (r = 0.62, P < 0.001). The aim of the research and the purpose of filling the questionnaires was explained to the participants. In case of agreement, written informed consent was obtained from all participants. To maintain the confidentiality and privacy of each person participating in the research, the names were not mentioned in the questionnaire and a code was allocated to each questionnaire. Data were analyzed using descriptive level, the mean and standard deviation were used to summarize the data. At the inferential level, Pearson's correlation coefficient and linear regression model were used SPSS package 18.0 for Windows (SPSS, Chicago, Illinois, USA). 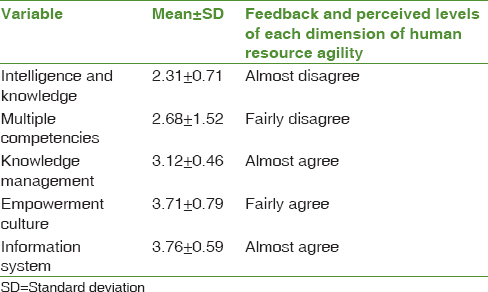 The mean and standard deviation of human resource agility dimensions are shown in [Table 1]. In order to investigate the correlation between the components of human resource agility and organizational performance of employees Pearson's correlation test and linear regression model were used. [Table 2] represents the correlation coefficient between human agility and its dimensions with the organizational performance of the staff. According to the table, there is a positive and significant correlation between the total score of employees' organizational performance and dimensions of intelligence and knowledge, multiple competencies, knowledge management, empowerment culture, and information system (P < 0.05). As it is shown in [Table 2], between the agility of human resources and organizational performance of employees, the correlation coefficient is equal to 0.754, and a positive and strong correlation were estimated. There was a moderate correlation between intelligence and knowledge and organizational performance of employees. There was also a strong moderate correlation between the dimensions of multiple competencies and the organizational performance of the staff. Between the dimension of knowledge management and employee organizational performance, a moderate correlation was observed. Similarly, a moderate correlation was noted between the dimensions of empowerment culture and organizational performance of employees. While there was a strong correlation between the dimensions of the information system and the organizational performance of the staff. To examine the correlation of five dimensions of human resource agility with organizational performance of the staff, the linear regression model was used. The entry of independent variables in the linear regression model was conducted using the enter method. Finally, the independent variable of the information system had the highest correlation, and after that, the variables of knowledge management, multiple competencies, empowerment culture, and intelligence and knowledge were ranked, respectively. The linear regression model between the two variables of human resource agility and organizational performance are presented in [Table 3]. As it is shown in [Table 4], the coefficients specified in the model are significant and the effect on the organizational performance of the emergency department staff with staff agility variable was 0.446 with an intercept of 2.289. The above model suggests that for one unit of change in variable X (agility of staff) average response (organizational performance of staff) changes as much as 0.464. Intelligence and knowledge have a significant correlation on organizational performance of TEC employees. There is a correlation between organizational performance of employees and intelligence and knowledge. In fact, the Pearson's correlation coefficient was significant at 0.05 and equal to 0.512, suggesting a linear correlation between employee organizational performance and intelligence and knowledge. Multiple competencies had a significant correlation with organizational performance of TEC staff. This means that Pearson's correlation coefficient was equal to 0.61 and significant at 0.05 level which suggests a linear correlation between employee organizational performance and multiple competencies. The accepted regression model at a significance level (0.000) suggests that a unit of change in multiple competencies (1.251) leads to changes in employee organizational performance, and the positive intercept (0.203) in the nonstandard regression model states that if multiple competencies are zero, then organizational performance will be as much in line with that. Knowledge management had a significant correlation with organizational performance of TEC staff. There was a correlation between the organizational performance of employees with knowledge management since the Pearson's correlation coefficient was equal to 0.57 and significant at 0.05 level, and there was a linear correlation between employee organizational performance and knowledge management. Empowerment culture had a significant correlation on organizational performance of TEC staff. In fact, Pearson's correlation coefficient was significant at 0.05 level and equal to 0.54 which suggest a linear correlation between employee organizational performance and empowerment culture. Accepted regression model at a significant level (0.000) indicates that a standard unit of change in empowerment culture (1.228), leads to change in employee organizational performance and the positive intercept (0.842) in the nonstandard regression model suggests that if empowerment culture is zero. Information system had a significant correlation with organizational performance of TEC staff. This means that Pearson's correlation coefficient was significant at 0.05 and equal to 0.63, suggesting a linear correlation between the employee organizational performance and the information system. The findings of this study indicated that there is a significant relationship between the performance in TEC and the agility of the staff and its components. Agility that comes with managerial training will have a profound impact on work characteristics and agile performance of the employees. Recent studies regarding the factors affecting the agility of the workforce suggest that adaptation of employees with technology and information has a positive effect on the agility of the workforce. In another study that examined the impact of employee participation in management decisions on the agility of the employees stated that employee involvement in decision-making has a positive influence on having agile workforce. In this regard, Aghahosseini et al. study that focused on the impact of human resource agility on crisis management confirmed that the agility of human resources has a positive and significant effect on improving crisis management in the blood transfusion organization. In a study about the association of organizational agility with job satisfaction of the managers, Sanadgol concluded that there is a meaningful positive relationship between the organizational agility and job satisfaction of managers. Similarly, in a study by Chung et al. regarding the evaluation of job performance, the role of organizational agility, location independence, and work characteristics that was accomplished through the mobile company system, the findings showed that organizational agility has a significant impact on job performance. A similar study conducted by Sherehiy and Karwowski regarding the relationship between the organizational performance and organizational agility in small manufacturing companies indicated that there is a significant relationship between the organizational performance and organizational agility. Furthermore, according to the results of Adibifard and Vazifehdust about the relationship between agility strategy, agile organization, and agile workforce in the emergency hospital of Tehran University of Medical Sciences, there was a fundamental relationship between strategic management, with an emphasis on work agility and agility of the staff. In line with the present study, the findings of Ziayi et al. regarding the determination of the model of development of individual capabilities of human resource to make small and medium enterprises agile, showed that the most important determining factors of the development of individual capabilities are human resource and information system, empowerment, competency, knowledge management, and intelligence and awareness, respectively. In another study, five dimensions and multiple indicators of human resource agility capabilities were reported as intelligence and awareness, multiple competencies, knowledge management, empowerment culture, and information system which is in agreement with the findings of the present study. The findings of Zohrevand study have also shown that simultaneous change in agility indicators can increase the agility level dramatically, while the low mean of each of them can drastically reduce the rate of agility by changing other indicators which is in agreement with the results of the present study. The findings of Zarkeshan study are also consistent with this research. The relevant results showed that there is a significant relationship between the rate of organizational agility and performance according to the different types of organizational culture in executive agencies. The change agility of human resources can simultaneously increase the speed of increase in the level of agility of staff and the low average of each one can dramatically decrease the speed of increase in the level of agility of staff by changing other indicators. Achieving success in today's dynamic work environment requires adaptability to change and agility in the organization. The findings of this study help to identify key factors in achieving human resource agility. One of the limitations of this study, the collection of data through self-reporting. This problem has, to some extent, been addressed by explaining the goals of the study to the staff. Furthermore, the problem of gaining the trust of employees in answering the questions of the questionnaire, unwillingness to respond due to the feeling that the job position is being compromised by answering to the questions, and existing limitations in the environment to access the information and statistics needed are among the other constraints of this study. So for maintain confidentiality and privacy of each person participating in the research, the names were not mentioned in the questionnaire and a code was allocated to each questionnaire. It is suggested that future research be conducted using qualitative methods such as in-depth interviews and focused group discussions to understand the organizational performance needs of the TEC using the experience of the staff and to take effective steps to improve agility of human resources. In addition, the participants in this study were all male, therefore, it is recommended that in future studies, women will be studied in similar organizations and comparisons were made between men and women in terms of human resource agility and performance. The TEC managers provide opportunities to acquire skills and training to increase staff utilization. Furthermore, Knowledge development can be improved by changing attitudes, increasing employee participation and their empowerment, and development of the teaching and learning processes. In this way, emergency situations and existing disasters can be effectively managed and can increase the efficiency of the emergency system in all functional areas. The authors want to express a special recognition to the staff of TEC who have participated in the data collection of this study, without whom the study could not be possible. Worley CG, Lawler Iii EE. Agility and organization design: A diagnostic framework. Organ Dyn 2010;39:194-204. Bahrami MA, Kiani MM, Montazeralfaraj R, Zadeh HF, Zadeh MM. The mediating role of organizational learning in the relationship of organizational intelligence and organizational agility. Osong Public Health Res Perspect 2016;7:190-6. Shahabi B. Human Side of Organizational Agility. Tehran: Tadbir Publishing; 2006. Qin R, Nembhard DA. Workforce agility for stochastically diffused conditions-A real options perspective. Int J Product Eco 2010;125:324-34. Molahoseyni A, Mostafavi S. Assessing organization agility by fuzzy set. Tadbir J 2008;17:3-5. Saadat A. Human Resource Management. 2nd ed. Tehran: Samt Publishing; 2005. Herzenberg SA, Alic JA, Wial H. New Rules for a New Economy: Employment and Opportunity in Postindustrial America. Ithaca and London: Cornell University Press; 2000. Hopp WJ, Oyen MP. Agile workforce evaluation: A framework for cross-training and coordination. Iie Trans 2004;36:919-40. Heidari M, Ebrahimi P. Examining the relationship between critical-thinking skills and decision-making ability of emergency medicine students. Indian J Crit Care Med 2016;20:581-6. Ghaniyoun A, Shakeri K, Heidari M. The association of psychological empowerment and job burnout in operational staff of tehran emergency center. Indian J Crit Care Med 2017;21:563-7. Heidari M, Shahbazi S. Effect of training problem-solving skill on decision-making and critical thinking of personnel at medical emergencies. Int J Crit Illn Inj Sci 2016;6:182-7. Aghdasi M, Khakzar Bafruei M. Measuring level of organizational learning capabilities in hospitals. Int J Ind Eng Product Manag 2009;19:71-8. Ali Mohamadzadeh K, Darabi A, Jafari M. The relationship between organizational agility and organizational health in hospitals affiliated to Shahid Beheshti university of medical sciences. J Payavard Salamat 2017;11:276-86. Chen Y, Wang Y, Nevo S, Jin J, Wang L, Chow WS. IT capability and organizational performance: The roles of business process agility and environmental factors. Euro J Inf Sys 2014;23:326-42. Shekarkan H, Neami A. Evaluation of the relationship between job satisfaction and organizational civil behavior and jobs performance in the personnel of some factories in Ahwaz. Psycho Edu J Ahwaz Shahid Chamran Univ 2011;8:1-22. Aslanpoor JM, Shahbazi F, Maleki R. The relationship between vigor, health and job performance in employees of the industrial company, Ahvaz J Soc Psychol 2012;7:65-73. Sumukadas N, Sawhney R. Workforce agility through employee involvement. Iie Trans 2004;36:1011-21. Aghahosseini EM, Rezaie DH, Nilipour TSA. The impact of human resources agility on crisis management (case study: Blood transfusion organization of Isfahan and other Three accident-prone provinces throughout the country). Emerg Manag 2016;5:41-9. Sanadgol M. The survey of relationship between organizational agility and principals job satisfaction. Int J Basic Sci Appl Res 2014;3:317-9. Chung S, Lee KY, Kim K. Job performance through mobile enterprise systems: The role of organizational agility, location independence, and task characteristics. Inf Manag 2014;51:605-17. Sherehiy B, Karwowski W. The relationship between work organization and workforce agility in small manufacturing enterprises. Int J Ind Ergon 2014;44:466-73. Adibifard S, Vazifehdust H. Relationship between agility strategies, agile organization and workforce agility in emergency ward of Tehran university in medical science hospitals. J Healthc Manag 2010;2:59-66. Ziayi M, Hasangholipoor T, Abbaspoor A, Yarahmadzehi M. Human capital with the goal of agile development model to explain individual capabilities of SMEs A study in companies based in Tehran university science and technology park. Public Manag Res 2012;15:27-44. Zahedi S, Khosravi A, Yarahmadzehi M, Ahmadi R. Dimensions and indicators of agility manpower. J Organ Behav 2013;1:1-24. Zohrehvand E. Examining the Relationship Between Organizational Agility and Performance (industrial production cooperatives of Arak). [Msc Thesis]: Malayer: Islamic Azad University; 2013. Zarkeshan F. The Relationship Between Organizational Agility on Performance According to a Variety of Organizational Culture in the Executive Agencies in Qazvin. [MSc Thesis]: Ghazvin Islamic Azad University; 2013.